This is one of my favorite things to grill all year long. It is almost as easy as cooking in the crockpot... with much tastier results! 2. Cut the rack in half and place in a 9x13 pan lined with foil. I know that some people like to season or rub the ribs, but I find that it makes it way too salty. If you use good sauce like Sweet Baby Ray's, no extra spices are necessary. 3. Cover tightly with foil. Play, nap, read, do whatever in the meantime! 5. Remove from oven. I'm sure I should stick some temperature guidelines here so you don't get sick from undercooked meat. But seriously, you know when it is done. The meat will almost fall off the bone when you transfer it to the grill-- so be gentle! 6. Heat grill. I also like to spray the grill with some high heat grilling oil to keep the ribs from sticking. 7. Baste ribs with sauce and place on grill. Remove when the sauce is nice and caramelized. :) I prefer mine a little scorched. YUM! Don't forget the extra napkins! To see other grilling recipes or to join in on the fun, visit Robyn at Our Homeschool Home. Oh my word, these look so good! Thank you so much for participating in On the Grill and for linking up. I'm going to have to try the oven trick next time! We love ribs, and these seem nice and easy. We'll be giving these a try for sure. Sweet Baby Ray's is our favorite sauce!!!!! Now I want ribs! These are really good y'all. This is my favorite easy thing when we have lots of company over. :) It's always a hit! bookmarking this. My husband is going to think he died and went to heaven. HE teases me about creating a perfume for women called BBQ Ribs! 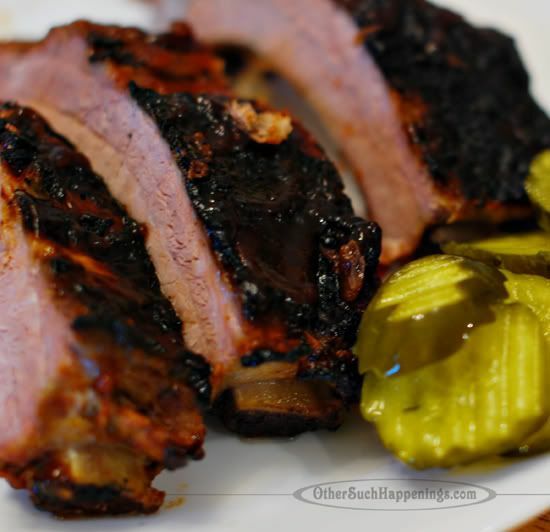 We haven't had much luck with BBQ ribs but your recipe makes it sound so easy. I'm saving it for later. We used to be fans of KC Masterpiece, but have recently fallen in love with Sweet Baby Ray's. Yum! This sounds so good. Mmmmmm! Looks YUMMY! Very summer-ish! YUMMY!! Oh my husband would FREAK if I made that for him. I have a couple of big time meat eaters! I gotta try this out. Mmmmm.... You're making me hungry! Need to wipe off keyboard from drool. LOL! It looks absolutely delish! Cant' wait to have bbq'd ribs!